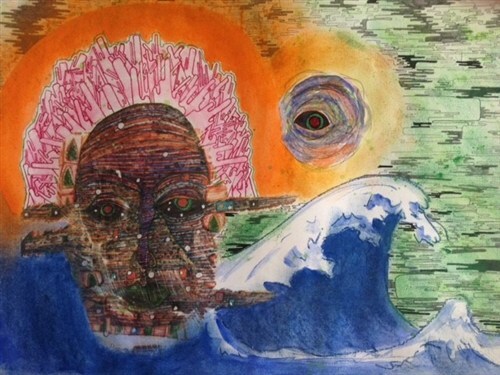 Please mark Thursday, March 28, 2019 on your calendar for this year’s Opening of our KES IB Art Exhibition. 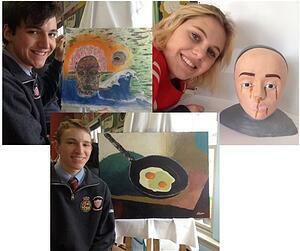 This exhibition will showcase the very talented work of our Grade 11 and 12 IB Art Students. We are very excited because this will be one of the largest shows that we have ever hosted with 50 students in this year’s exhibition! Watch for your invitation. Here are the next three highlighted Artists, and I hope you enjoy getting to know them a little bit better. Linus Mulherin is from Port Williams, Nova Scotia, and he has been at KES for six years. Future plans: "I plan to attend university." Clare Bennett-Gibbs is from Chester, Nova Scotia, and this is her second year at KES. Future plans:"I plan to attend university." Aidyn Scott is from Kentville, Nova Scotia, and he has been at KES for seven years. “I chose my oil painting of the Frying Pan as my favourite piece. I enjoyed using the palette knife for the first time as it was interesting to try a different medium. I chose this subject because it is a household item but not everyone thinks of it as an art piece. Art can be found in anything and anywhere." Future plans: I plan to study architecture at university. Learn about our Fine Arts curriculum from Grade 6 to IB Art as well as countless extra curricular opportunities to express your artistic passions. 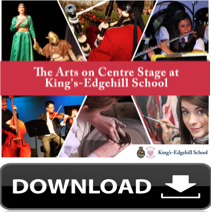 Explore King’s-Edgehill School with this short video. Tour our campus and see inside Canada’s first independent school. Want a better picture of what it’s like to be a student at King’s-Edgehill School? Our photojournals will walk you through a typical day for Day Students and for Boarding Students. Download yours now for a peek at one day as a KES student. KES inspires academic, athletic and artistic excellence with a commitment to the traditional community ideals of gentleness and learning, dignity and respect, so that students may discover and cultivate their unique potential, prepare for post-secondary education and develop a life-long enthusiasm for the spiritual and intellectual growth necessary to flourish in the contemporary world. King's-Edgehill School is a coeducational boarding and day school for grades 6 through 12, located in Windsor, Nova Scotia, Canada.